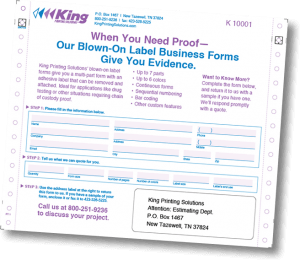 Custom affixed label/information forms make your store look more professional. We currently work with a number of companies to offer customized, cost-effective forms that let you project the right professional image—and build trust and brand recognition with your customers. Labels sheets are designed to work with your printers to minimize your ink usage, load easily, and make sure patients see your store’s identity and key contact information. We offer fast turnaround and exceptional quality. You want to convey a message of quality and professionalism. Our forms make sure this happens. Special Offer: Order now, and we’ll design and set up your graphics free—a $250 value. Contact us for details.